Digicel Vanuatu donated $1,000 AUD in support of ProMedical, a non-profit organisation which provides Australian-standard paramedical pre-hospital emergency service to the people of and visitors to Vanuatu. ProMedical’s chest compression machine, Lucas 2, has saved the lives of many cardiac arrest victims. However, it stopped working and Digicel Vanuatu immediately stepped in and offered a sizable donation towards repairing Lucas 2. The Digicel Vanuatu staff pushed the contribution even further. 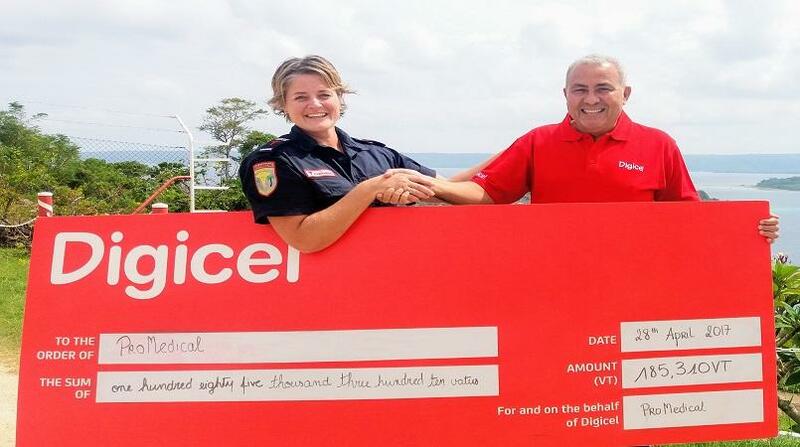 To raise additional funds internally and externally, Digicel employees worked together and started two raffles which brought an additional 100,000VT to the ProMedical cause. “Digicel is determined to get the Lucas 2 machine fixed as soon as possible. Dynamism and commitment are two of our core values. We are happy that we used those to support a great cause. We want to make sure that many other lives are saved with an operational Lucas 2 machine,” said Yaser Maher, Digicel Vanuatu CEO. Peta Owen, ProMedical Operations Manager, declared; “I want to thank Digicel Vanuatu for the generous donation and the ongoing support to our vital pre-hospital emergency support service. I would specifically like to thank the Digicel employees who have contributed their time, commitment and dynamism to raising additional funds”.